Congratulations to "Val P" the winner in Angi's giveaway. Thank you to all who participated. One of my favorite type of stories to read is about twins, especially twins that can switch places and cover for each other. And I love the brooding hero that gets a major chip knocked off his shoulder by a loving heroine. 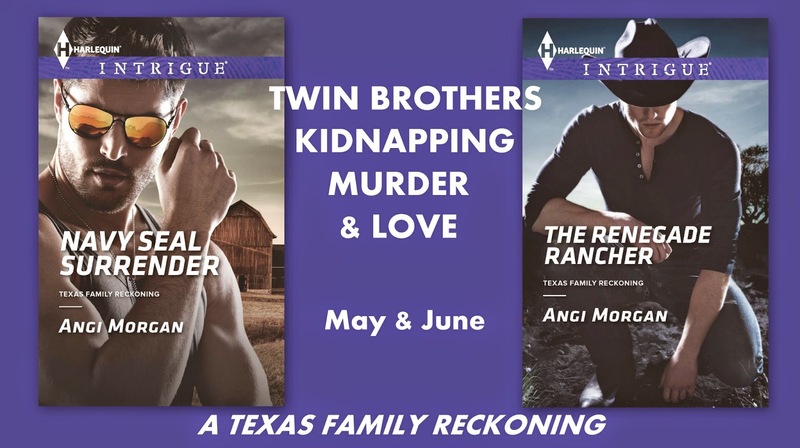 Throw in a murder from the previous decade, a high school sweetheart that married your best friend and a kidnapping… then you have TEXAS FAMILY RECKONING. My "boys" are John & Brian Sloane and their story begins much earlier than the beginning of NAVY SEAL SURRENDER. The Sloanes are identical twins, but couldn’t have been more different growing up. Brian: responsible, trustworthy, a protector. John: prankster, outgoing, an adventurer. Their high school graduation brought hope of leaving their small Texas town and fading horse ranch. They were about to begin two separate lives and discover their individual dreams when a fire changed them forever. Witnesses put one of the brothers at the scene. Each knows he's innocent and tries to cover for their brother. There's the rub…they both thought the other accidentally started the fire. However, the off-book op poses unfamiliar dangers to John, none more risky than his feelings for Alicia. To regain her trust and protect her from the kidnappers, he'll risk his career and even his life. It all hinges on one daring scheme that could prove he's the hero she needs—or break her heart all over again…. "With Navy SEAL Surrender, Morgan launches a new small-town mystery series with strong characters and a richly developed plot with crosses and double crosses in every chapter." "This is an action packed story that takes some clever twists to make this one a very hard book to put down. The reader can really relate to the characters and sympathize with them as they deal with the nightmare their life has become. With every word the story comes to life and takes the reader there so they can feel what the characters are feeling. This is a nice second chance at love story that is sure to please readers. It will also leave the reader hoping for more books to see if the other characters get their own HEA." ENTER ANGI'S monthly giveaway contest: register at Rafflecopter through April 30th for a $10 gift card. DO YOU LIKE IDENTICAL TWIN STORIES? Leave your opinion for a chance to win. Oh I am definitely a fan of twin stories, especially identical... love mistaken identities or seeing what one personality is like over the other... seeing how they deal with looking like each other, and how others treat them. Thanks for sharing Angi! Happy April! And a very HAPPY APRIL to you, Colleen! Thanks for stopping by. Good to see you, BN! There is so much fun to be had with twin characters. There are so many miscommunications and trouble the two can get into. The difference in the two personalities and then you know there is always going to be a book 2! I can't wait to read Renegade Rancher. thanks for giving us the opportunity to win. Thanks Val. You summed up everything I like !! Congrats Angi on the new release! I like twins stories in theory... haven't really read any in a long while... lol... all that comes to mind is Parent Trap! Thanks for sharing! And thanks for stoppig by Erin ! I am always fascinated by identical twins and the stories are always so interesting to read. Hope you'll try Texas Family Reckoning ! Thank you Janice. I grew up with a set of twins...yes, soulmates. It was horrifying when we lost one to breast cancer. And I coached a set of twins on softball...now that was an interesting experience (especially for the other team). Oh how I love the sound of those words !! I love stories about twins. (Of course I am a twin!) This book sounds awesome! Can't wait to read it!! Thanks for coming by Kathleen !